Upon finishing a call, you can mark the number or contact as personal or business related, save new numbers as a contact, indicate the result of call using a disposition, add notes and set a callback date. 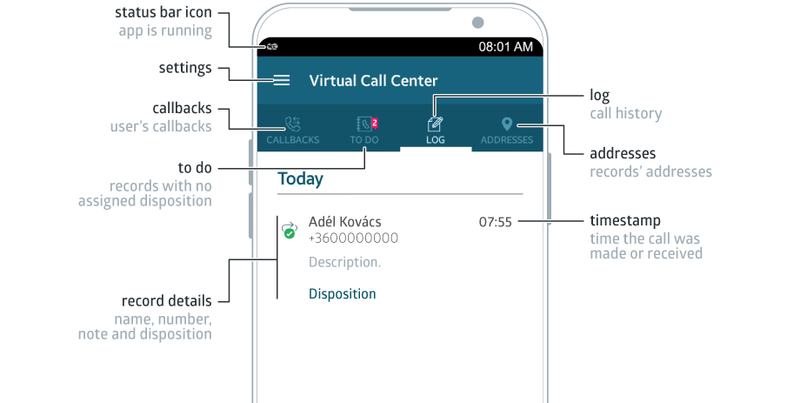 Note: The app uses a foreground service to ensure that your business calls are logged and dispositions can be used, even when the application is not displayed. Tip: Glance at the badge to find out how many callbacks and records with no disposition you have. Hang up the call or wait until it ends. Mark the call as personal or business-related. Unsaved numbers can be added to your contacts. Tap to add a note, disposition and to set a call back date and time. Tap Save or Later. Note: You can go through each of your existing contacts to mark them as Business or Private, set it manually after finishing each call, or set a default option. Read more in the Number Assignement Settings section. Tap the number you want to call. Swipe down from the top of the list to refresh content.